Sorry it's been a hot minute since I've posted anything up here, I have been super busy doing lots of other bits and bobs, trips to London here and there and as some of you may have seen - launching my Youtube channel! If you haven't seen it yet click here to head over! I'm aiming to post once a week on there, so make sure to subscribe so you don't miss anything! Anyway, I thought I would strip it back to basics and do an outfit post! I mentioned this dress on my most recent YouTube video and I couldn't decide whether or not it was 'my style'. I think it's so easy to get stuck in a comfort zone & feel as though you can't branch out and try new styles - which is ridiculous but it does happen to so many of us. I adore this dress and every time I saw it in the shop I picked it up then put it down for about a week until I decided that, it may not be my usual style, but I loved it and so I would make it work for me and honestly I'm sooooo glad I did because it's amazing!! This dress has an effortlessly gorgeous look to it. The floaty fabric gives off an illusion of almost boho sheek that is so easy to wear yet with the simple addition of accessories it turns it into a classy and sophisticated look. 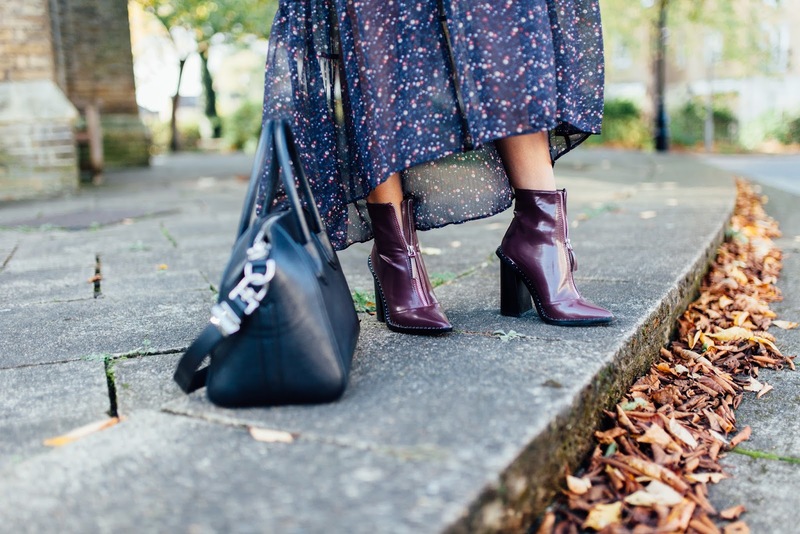 It's such a lovely combination and it is a great addition to my wardrobe (for summer and winter!). 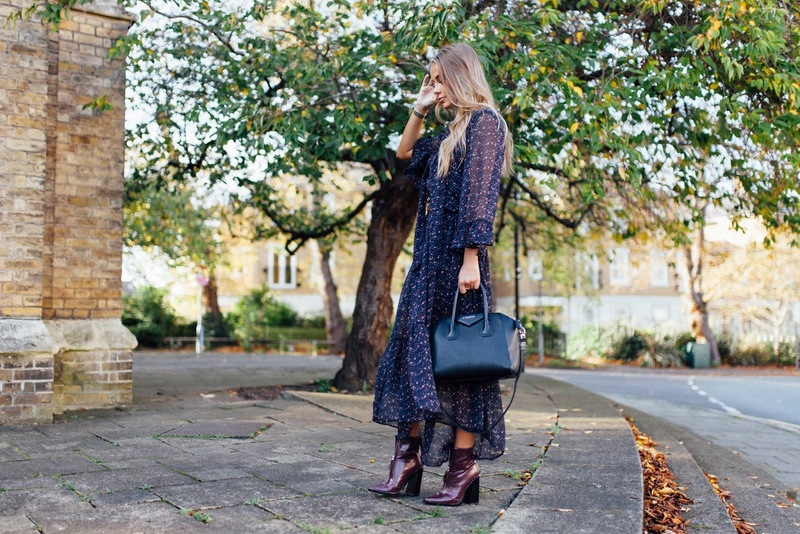 This dress is a piece that definitely pulled me out of a 'beginning of Winter wardrobe funk' and it's actually made me excited about Autumn/Winter clothes. It has also been soooo warm (until 3 days ago) for this time of year, so having a piece like this is great as you can layer it up as many times as you like & still look fab. The day I wore this it was ridiculously warm, so I wore a fur gilet over the top.. which was swiftly taken off whenever the sun decided to pop out! I added my Gucci belt around the waist to hitch the hemline up at the front so you could see my new gorgeous boots! 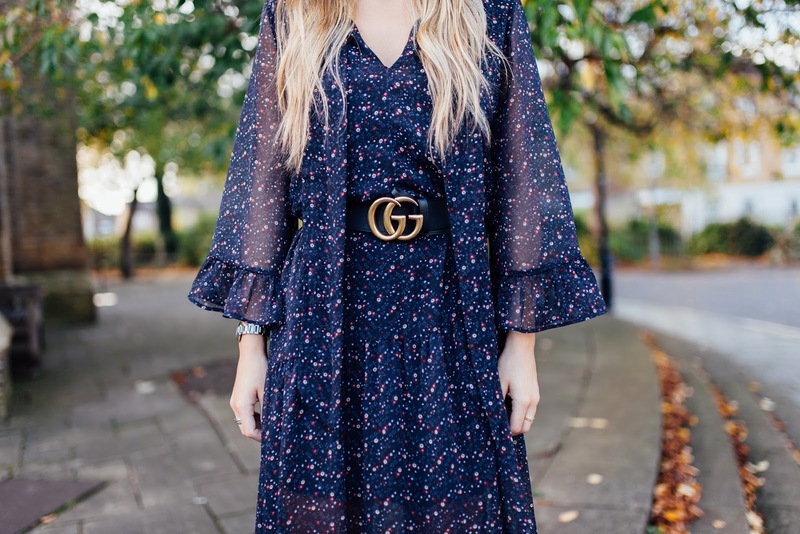 This dress is a maxi so by bringing up the front it makes it look completely different and more wearable for day time (in the UK), as well as giving it a more 'cool' and put together feel! I'll definitely wear this as a maxi on holiday though, it's great to find pieces that can be worn in all the different seasons!